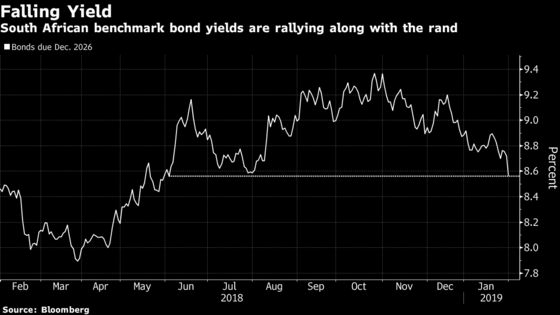 (Bloomberg) -- Benchmark South African bond yields dropped to eight-month lows in the wake of the Federal Reserve’s more dovish stance -- and there may be more to come, with inflation expectations plummeting and investors pricing out any chance of a rate hike in the next two years. Yields on government securities due 2026 fell 16 basis points on Thursday to the lowest since June 1 on a closing basis. South African local-currency bonds have returned 7.8 percent this month in dollar terms, the most out of 25 developing nations tracked by Bloomberg Barclays indexes and more than four times the emerging-market average. 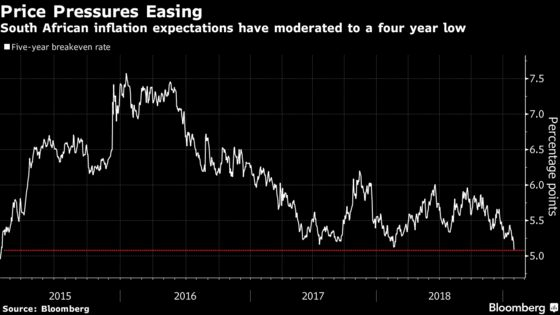 Inflation expectations for Africa’s biggest economy, as measured by the five-year break-even rate, have dropped to the lowest since February 2015, suggesting bonds may extend gains as slowing price increases support real yields. The producer inflation rate fell to the lowest in eight months in December, data showed on Thursday. No wonder that bets on a rate increase in Africa’s most-industrialized economy are off the table. 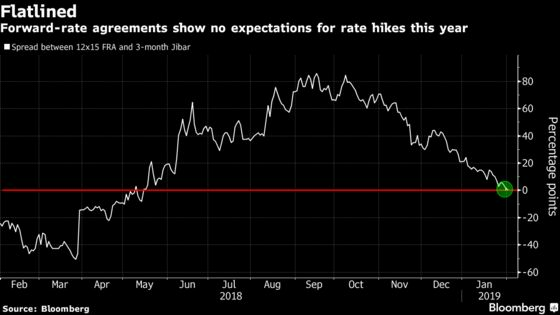 Forward-rate agreements, used to speculate on borrowing costs, have priced out any chance of a hike for the next 24 months. As recently as December, the contracts implied a 52 percent probability of a 25-point increase this year.